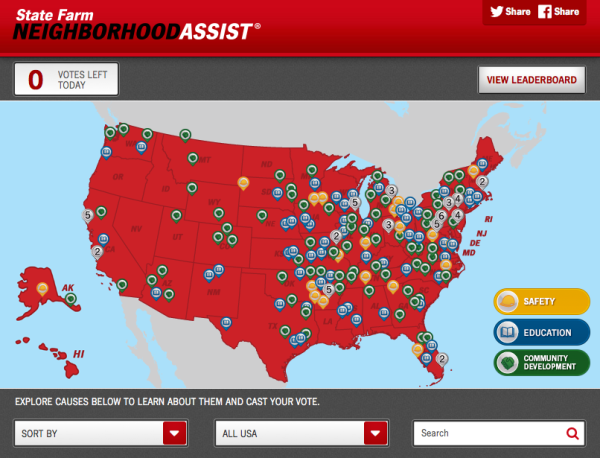 I’ve been voting in the State Farm Neighborhood Assist program. And it really does make me feel good knowing I’m helping out great causes in great communities. My community is important to me. This is where I am bringing my son up. Our communities help us as parents by providing safe places for our children to learn, grow, and play. Whether it’s schools and after school programs or community centers, State Farm Neighborhood Assist helps non-profit organizations right in our own backyards. State Farm Neighborhood Assist encouraged people to submit a cause that they felt was important in their communities and the chance to raise awareness of this cause. 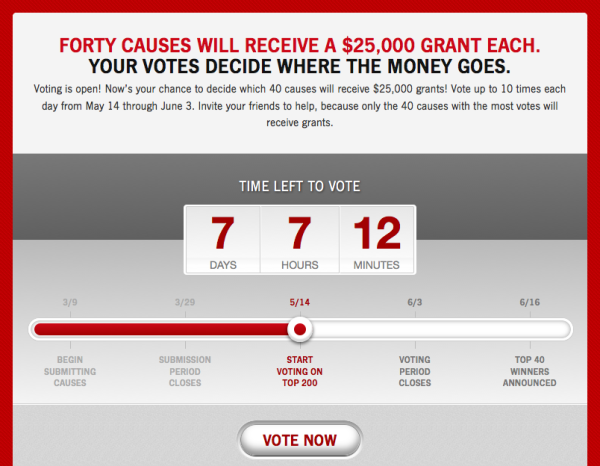 Then enlist people to vote for their cause for a chance to win one of (40) $25,000 grants, exclusively through Facebook. That’s a lot of assistance. What is State Farm Neighborhood Assist? State Farm Neighborhood Assist helps people identify problems in their community, then helps them to connect with local nonprofits that can assist them in solving the problem and then providing an opportunity for communities to receive funding to make a positive influence in their neighborhood. I love that State Farm incorporates a State Farm Youth Advisory Board, which is made up of 30 full-time high school and university students ages 17- 20 from the United States, and challenges them over a two-year term of service, to put into place a $5-million-a-year learning service initiative to address issues in their communities they think are important. My son is only twelve, but I thought it was important to let him help me decide what non-profit(s) to vote for… you get 10 votes a day and you can choose to cast all 10 of your votes for one program or to spread the 10 votes out among two or more causes. One day we may cast all 10 of our votes to a non-profit in Tennessee, which there are 6 of, by the way, or find a non-profit issue in a particular category that is important to you like education, safety, or community development, whether it’s in your own state or somewhere else in the U.S.
It’s so easy to vote and takes just a few seconds to a few minutes, depending on how many non-profits you use your 10 votes on. My son says it’s too easy to vote on State Farm Neighborhood Assist on Facebook that anybody could do it. I encourage you to vote in the State Farm Neighborhood Assist program and help a non-profit in your own neighborhood, because YOU can make a difference! Go to http://statefarmyab.com/projects/neighborhood-assist/ to see previous winners. Connect with @StateFarm on Twitter. A very great program! I wish more like this will spread to the whole world for a better food production! What a great program! Any time a company gives back it makes my heart happy. This sounds like a great program. I will make sure I vote and I will also share this with family and friends. State Farm has been our insurance carrier forever and I’ll sheepishly admit I had no awareness of this program! I’m definitely going to do more research about it in my area. Thank you for this great post! This is a great campaign. I like to hear about companies giving back to communities. I know there are so many communities in this country that could benefit. It is great that State Farm is doing this. Nonprofits are so essential to society today. love that it focuses on our communities. This helps with narrowing down what we need help on within our neighborhoods.. Such an awesome program. I love this and how they are looking out for the area. I have heard great things about State Farm insurance, I love their commercials too. Thanks for sharing some info about them! Wow. I haven’t heard of State Farm neighborhood assist. Sounds like a great program. Congrats to State Farm for MAKING A DIFFERENCE! I think it is great when large corporations are dedicated to helping. This sounds like a really cool app. What a great way to come together with your neighborhood and help a good cause. This is very refreshing to hear. I had no idea State Farm did any of this! The Youth Advisory board is especially neat!